Still confused? Well, the Penguins lost 3-0 to Binghamton last night in spite of having their line up the healthiest it was in a long time. The Senators scored one goal in each period and Chris Holt stopped all 28 shots he faced to earn the win in net. Ryan Bayda, Zach Sill, Wade Brookbank, and Jon D’Aversa all returned to the lineup after missing time due to injuries. Since there is just nothing good to say about last night, there will be no extra points. However, there will be a penalty to the Penguins’ inconsistency so far in 2010. After winning four in a row and promising they were a re-energized and refreshed team; the Penguins have faltered back to where they were at the start of the season. Since New Year’s Day, the Pens are 2-4. The season is going fast and with the majority of players back from injury, the Baby Penguins will have to find the consistency they need to compete with teams such as Albany and Hershey. Sure, we are missing some players due to call ups, but the team must find the depth and step up to the plate to fill in for their absent teammates. When: Saturday, January 16, 2010 at 7:00 p.m. Although the Penguins got on the board first on a Mark Letestu power play goal, Hershey ruined the Pens’ New Year by winning the game 3-2. A shorthanded goal in the second period by Patrick McNeill and Andrew Joudrey turned the tide in the Bears’ favor. Chris Bourque had Hershey’s other two goals. Penguins’ fans loathe Hershey with every fiber of their black and gold being, but honestly; it is very hard to find something bad to say about this Hershey team the last couple seasons. After winning the Calder Cup in 2009, the Bears are still making the rest of the AHL look like pee-wees with a record of 30-9-0-2 for 62 points; so basically, they are running away with the East Division and likely the Eastern Conference. 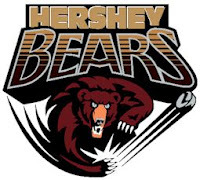 On Friday night, Hershey responded to the end of their 12 game losing streak on Wednesday by starting all over again and rolling over Albany by a score of 10-4. It was the most goals the Bears scored in a victory this season, and yes they have previously scored eight and nine goals in a game. Hershey is also top ranked in the penalty kill, fourth on the power play, and have a top rookie netminder in Braden Holtby. Basically, find me something that Hershey isn’t the tops at. When you do, let me know. Anything less than a full, 60 minute effort tonight is unacceptable on the Penguins’ part; especially when you add in a hostile Giant Center. The Hershey fans can be as dominant in the stands as their team is on the ice. Rookie goalie Braden Holtby is making his mark on the AHL. Although he started the season going back in forth between Hershey and South Carolina of the ECHL, he leads AHL goalies with a .943 save percentage and a 1.63 goals against average. Holtby has already stumped the Penguins twice this season; will he do it again? Keith Aucoin and Alexandre Giroux: The pair is dominating the AHL leader board for the second year in a row. Aucoin has 20 goals and 29 assists on the season and is second in the AHL in goals scored. Giroux, who had a record setting 60 goals last season, has 17 goals and 30 assists for 47 points. Shutting down the Aucoin-Giroux pairing will be essential to the Penguins taking control of the game.